The first thought that came into my mind after visiting Okara can be described by four words: milk, butter, mammals and farms. Peers also told me the same. Besides Harappan ruins, I did not know the area. But one thing I did know, though, was that I should be happy to say goodbye to the place. Two years later, I felt drawn to the area and its people and it was very hard for me to part. There is so much to be seen, so much to be done. 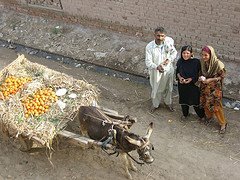 Above all, it has spirited, sincere and full-of-love people living in Gogera, Dipalpur and Pakpattan historic trilogy. The distances in the hinterland are short but the landscape is so enormous that it had to be studied in parts like a large mural seen by a child. One of the first places I came to know after settling down is a village Thatta Ghulamka Dheroka near Okara. 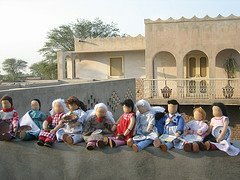 The unique claim of the village to international fame is the dolls and toys made by village women that are a collectors' delight all over the world. Dolls made in the village have traveled to International Dolls Museum in Amsterdam and also have been put on display in the EXPOs Germany and Japan. Earlier, the dolls participated in the International Toy Fair in Nuremberg. These dolls show how culture goes beyond simple works of art and becomes a collaboration among applied and natural sciences as well as other forces that affect our lives. Murals are painted on the parameter mud walls in the village where doll collectors and people interested in sustainable development and rural heritage come and stay as paying guests. The village folks still consider cooing crows as symbol of the arrival of the guests. 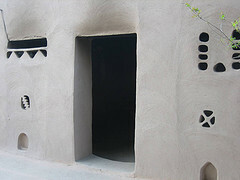 Architectural competitions are held annually when the best mud house is selected. The Chief Harappan Explorer Dr. Mark Kenoyer had the place on the jury in competition held last July. Two full time German volunteers, Dr Norbert Pintsch and Dr Senta Siller, and village people are working together to change the life and outlook in this peaceful hamlet. Whenever I visited the village, I saw something new, something different, which the villagers do to make difference in a place where they belong. When going to the village you pass through Gogera -- a famous place where Ahmed Khan Kharral broke jail during the War of Independence in 1857, and the place where Extra Assistant commissioner Berkley was defeated and killed by the resilient locals. East of Okara, there are four places which provide you reason enough for going there again and again: Malka Hans, Pakpattan, Dipalpur and Sher Garh. Each one of these places holds thousands of intriguing secrets. There are at least two folk romances that unfailingly echo in the mind of anyone who let his fancy and feet roam around this historic tract. Waris Shah composed his classic folk romance Heer Rangha during his stay in Malka Hans - a 700 year-old town. 'Hujra Waris Shah Da' located in an ancient mosque, constructed during the rule of Hans tribe, and the remains of five-story temple of Parnami faction of Hindus in Malka Hans, merit attention, which has not being given. The temple cannot be described in words or images. I sat on the heap of rubbles in the courtyard of the temple where people dry grains, keep the animals, and wondered. As per another famous lore, the nearby town Hujra Shah Muqeem is the place where Saheban is supposed to have visited and prayed "sunjain howan gallian which Mirza yar phire" (the streets should be deserted for my lover Mirza to roam around). The tale is mentioned in famed Punjabi love story Mirza Saheban, but there is no historic evidence that Jatti Saheban came to the place and prayed. Both these romances are vital part of our widespread oral literature, Recitation of Heer, in a single and vibrant tone. It is an amazing phenomenon. There is another love story set in Mughal period living village Akbar near Gogera. A girl jumped into the grave when people were burying her lover and insisted that she be buried alive with him. The grave is still there on the citadel, accumulating debris of ages, in the village. Pakpattan and Dipalpur are two of the oldest living cities of the South Asia and strategic sites of the past. A complexity of ideas, directly related to evolution of civilization in this part of the world, seems encircling these places. Besides kings and sultans - from Sabuktigine to Akbar -- great men like Ibn-e-Batuta, Amir Kusro, Gru Nanik and Waris Shah visited at least one or both of these places. One of the thriving trade routes of the past passed through Adjodhan (name officially changed by Mughal King Akbar to Pakpattan due to its association with Saint Baba Farid ud Din Masod Ganj Shakar). Now the original builders might not even recognize these towns if they come back. These locations are not mentioned in travel guides, but anyone who wants to re-live the past can go there and know more about the archives. In Sher Garh, you see a towering shrine of a saint Muhammad Ibrahim Kirmani Daud-e-Sani Bandgi. Sit for a while in the restful compound of the shrine and somebody will offer you food and some other might tell you a tale: the mason from Kasur, who installed the heavy pinnacle on the shrine, asked Shah Abdul Mou'ali to give him the best buffalo in his heard as charge of expert services to fix the pinnacle. The mason demanded this when he was standing at the top of the edifice of shrine before putting the final touches. Shah Abdul Mou'ali, who was the direct descendant of the saint, obliged the artisan and only then he came down, happy. Those were the days of commitments and reciprocal rights. Before turning to Sher Garh from National Highway near Renala Khurd, one may visit the still functional Ganga Hydroelectric Station installed by the famous philanthropist and engineer Sir Ganga Ram. All these places in the trio introduced me to wonders and legions of what may be called middle ground of cultural fusion of the present Punjab. The area is a gold mine for history seekers, spiritual and curious travelers. You may find much more than what you hear or read. It pays to get out into the countryside and talk to ordinary people. People of the area are eager to help - on their own expense - when you ask them. I found volunteer 'guides' who were forthcoming with a wealth of information, from history to myths prevalent in the area. Where is Qaboola? Ask anybody when you are riding a bike with haversack and water bottle on your sides. The replies will always be same: nearby. The ironic counter point is the lack of attention in maintaining the bits and pieces of unique heritage - the resource base of tourism. The neglect may be attributed to lack of awareness, education, coordination between authorities, economic constrains and/or simply the natural hazards. The magnificent vistas of a land of plans, fields and orchards have to be opened to the rest of the world. There is a need for information in the form of travel guide writing, pure travel journalism, travel book writing and geographical description in form of maps. No ordinary coldness of phrasing can express the surprise and delight, with which one makes acquaintance with the sites. Their perspective gives you a wonderful sense of being there. In fact, that is my recommendation: be there. drop by here from MALAYSIA. nice n great to know this blog.keep on writing.